Like most things in life, a routine is the key to good dental health. A healthy routine will consist of brushing twice a day, flossing daily, monitoring the consumption of foods with high sugar and acid content and it will also involve regular dental check-ups. You should visit your dentist every six months for a thorough scale and clean. This visit will also allow your dentist to get an overall impression of your dental health. 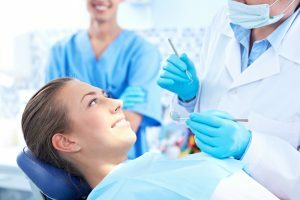 If you’ve been less than vigilant with your visits to the dentist, here are a few reasons that might help to motivate you to book in more regularly. Minor problems such as build of plaque and tartar can turn into a very serious problem if left untreated. If you go to the dentist regularly, your dentist can clean away the plaque and tartar easily. However, if this harmful build-up is left on your teeth, you can quickly develop gingivitis and even more serious forms of gum disease. Treatments for both of these problems can be invasive and painful. In the case of advanced gum disease, you may lose multiple teeth and have to undergo expensive treatments to restore your smile. So, save your gums and your money by getting along to the dentist every six months for a scale and clean. A gappy smile isn’t appealing to anyone. The best way to avoid losing teeth is to go to the dentist for regular check-ups. Gum disease isn’t the only way you can lose teeth. Your teeth may look white and healthy but they may be decaying under the surface, and if the decay spreads too far and creates deep cavities, you could potentially lose teeth. If the decay is found early, a simple filling is all that should be required. This is a far better option than root canal treatment tooth removal, an expensive dental implant, or an annoying set of dentures. Bad breath or halitosis is usually caused by dental problems. Gum disease and the build-up of decaying food matter are key causes behind bad breath, so if you want to keep your mouth fresh and not have people ducking for cover whenever you come near them, go to the dentist! A regular professional clean at the dentist is a great way to keep your teeth white. A scale and clean can remove the stains caused by wine, tea, coffee and smoking. Brushing at home just doesn’t have the same effect when it comes to lifting stains when compared to a professional clean. Keep in mind too, if the stains become too deeply set you will probably have to opt for a whitening or veneer treatment down the track. Regular visits to the dentist can help detect minor problems before they become large ones—and that extends beyond just dental health issues. Dentists can pick up on throat and mouth cancers before they spread and assist you in alleviating problems associated with sleep apnoea. Dental health has also been associated with decreasing the chances of heart disease and stroke. We know that our overall health is the sum of many parts so help out the rest of your body by keeping your mouth healthy. Most private health funds will offer a free bi-yearly dental check-up. Your private fund costs you money so why not get your money’s worth by getting along to every free check up. You may think that you’re doing the right thing by your teeth but a visit to the dentist could actually show that your home-care regime is doing harm. Brushing your teeth too hard can cause receding gums and a whole host of other problems. Your dentist may also find that you are missing parts of your mouth when you clean or suggest that you avoid certain foods that are staple of your diet. Unless you’re going to the dentist regularly you will miss this important information and these harmful habits will become ingrained in your regime and cause undue harm to your mouth and teeth. So, if you’ve been coming up with excuse after excuse to avoid going to the dentist it’s time to reassess your priorities. A healthy mouth is an integral part of a healthy lifestyle and your dentist holds the key to full dental health. All it takes is a short appointment twice a year and you can avoid a number of serious dental and health problems and you’ll also give yourself the best chance of maintaining a full, gleaming smile for the rest of your life.